The Sith fighter was a starfighter that formed the bulk of Darth Revan and Darth Malak’s space forces during the Jedi Civil War, as portrayed in the videogame STAR WARS – Knights of the Old Republic (KOTOR), nearly 4000 years before Darth Vader’s rising to power. Revan (soon to be included in this set has a minifig) is the main protagonist of Knights of the Old Republic. As the Dark Lord of the Sith and Master of Darth Malak, Revan was led into a trap where a Jedi strike team, led by Bastila Shan, infiltrated his flagship and unknowingly helped by Revan’s own apprentice, captured him. Revan was badly wounded and his mind was nearly destroyed from the battle so the Jedi Council, in a bold move, programmed him with a new identity, one that is loyal to the Galactic Republic. Enlisted as a Republic soldier, Revan is caught up in events that lead him to rejoin the Jedi Order as a Padawan and travel the galaxy in search of enigmatic Star Maps in an attempt to foil the efforts of the Sith Empire of the Star Forge. You can head over to the project to read the rest and to see more images. All in all, it’s a sleek design, a viable project and something we’d love to see happen. If you like the idea and concepts, you can sign on as a supporter, too and help them reach their goal of bringing this to production. 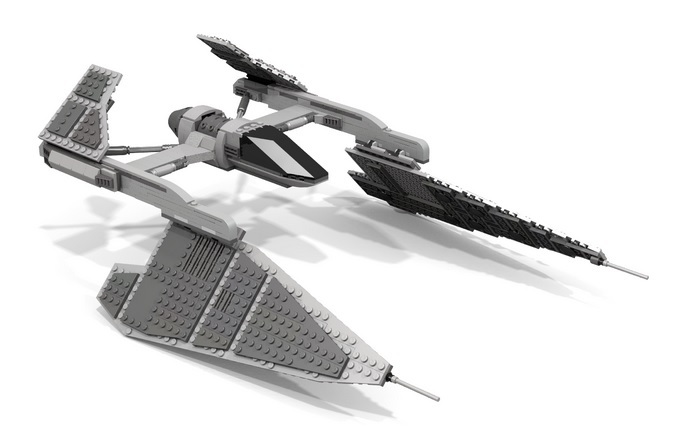 Also support LSX2017’s Aurek-class strikefighter . It’s amazing.